My grandad talks a lot about having a weathervane. He had one some time ago and it was just a cheapo aldi thing and some how broke so he took it down. I think I`d also quite like one myself so my idea is to make a couple. 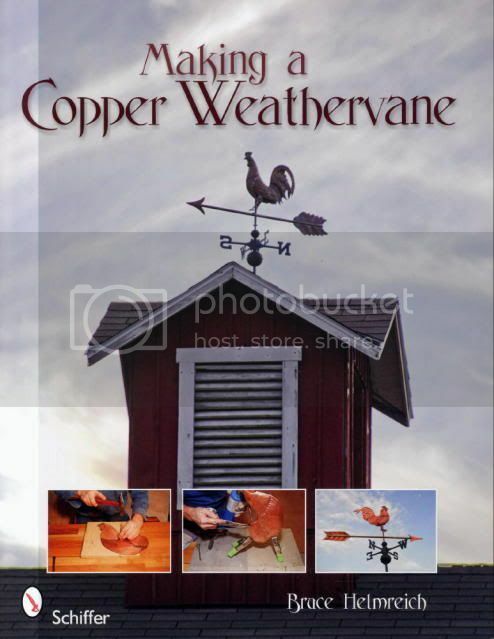 I presume the basics of a weather vane is that you have a art design of some sort with an arrow on the same plane?? Then though could be silver soldered or bracketed to a metal bar that drops into the supporting pole and can turn on a bearing? art really isn`t my strong point (not that I would draw the image, I`d just trace it from a print out!) but how big would you expect that image should be to get a decent looking size when on the average home roof? Also, would it have to be cut from sheet steel or would some sort of plastic be OK. I`ve just built my CNC router but with only a 12 -x 10" bed it`ll be too small! I`m prepared to cut it by hand, but out of metal it could be tricky! So a very open conversation if anyone is prepared to chip in. What materials, sizes, tools....etc would you use to make a weathervane - bearing in mind I`m trying to keep within my tool and capabilities? The little N, E, S, W letters I will be able to cut using my CNC machine and I`m looking forward to that, but the bigger image I`d have to do some how by hand!?? You could rivet the parts together and bend the letters from flat bar ,, B n Q do short lengths ,, Not the cheapest metal supplier but if you only need a few short lengths ,,,, just a thought . How big are you planning on making it ? you can buy reasonably thick copper sheet on ebay, that can be cut on a fret saw or even ally sheet and as Rob says can be riveted but the copper might look better cover in Yogurt and get the patina started .this one is similar to yours but would probably blow up OK.
You ask about plastics - ought to work, but long term exposure to UV (sunlight) will lead to plastics going brittle cracking and eventually falling apart. Some will stand up better than others (depends on additives and pigments incorporated), often impossible to get the detail needed to know for sure. Plastics (unless reinforced) probably also a bit 'floppy' for this. Anything in tat lot take your fancy ,? A couple of things to keep in mind, it has to be balanced to the mid point so the sail works to turn the direction pointer with the wind. The larger the area presented to the wind, the stronger and better the mounting must be. As the forc e of the wind can be great on it. Keep the bearing surface simple, no fancy bearing assemblies. A single chrome or stainless steel ball bearing sitting on a rounded point of a brass or stainless rod with the tube over it. And no grease used what so ever as that can cause problems over time. And if it is going on a roof of a building or barn remember that you should check on your local codes for lighting arrestor requirements. As a metal device will attract. You can do one out of wood, plastic, metal just about anything you can lay hands on. 16 ounce 24 gauge, roof flashing copper will work. There are 3 styles of bodies flat (silhouette), swell body, and the a full body. The swell body is only slightly formed or rounded to give some form and shape. One last item if it is heavy or large in sail area, and mounted on a building. The mounting pole should go through the roof and mount into a beam in the attic area at least 2" deep into a beam. The above book has 290 step by step color photo guide, using only basic tools. Hi guys, that was a nice response in a single day - thanks for all the info. Peter: Copper sheet certainly seems like a good idea! Never even considered that. David - yes, never considered plastic breaking down but of course it will - thanks for pointing that out. Rob - what book is that with all those images? Seems a cracker! I personally like 945 but I though i`m not a cat fan, I actually quite like the idea of the cat and mouse on 928 but I think my grandad would like a ship - there are lots of very nice ones but I expect something simple like 961 is more within my capabilities! PTsideshow - That certainly looks a great book. I`ll look on amazon later but £22 on ebay in the UK which isn`t going to break the bank but will have to wait a few weeks. You have made some valid points about mounting and design. I really don`t want to make anything massive that would require anchoring into a beam!! For now I think I`ll stick to a simple flat body as I don`t think I`m skilled enough in art for sculpting a surface texture! That would be pretty amazing though making one in full profile. Just to give me an idea of size. If we took the classic cockrel on 913 to look of a good scale, on the smaller rather than larger size ontop of a standard single story house roof, what sort of size would you expect it to be? In other words, taking any of those images, what size sheet do you think you would be looking to cut it from? Interesting book glen ,,,,,,,,,,, i will have to look into getting hold of a copy ,, your right swelled bodies do look better . There is a copy of the catalogued of designs i have for sale here Chris ,,,,,, http://www.oldtools.co.uk/tools/Tool_Catalogues.html scroll down a bit. I would say go for about A4 full may be a good starting point for size . As for the swell bodies it isn't that hard or difficult to work each side from both sides then solder together. It is just a modified chasing and repouseé technique. I believe I posted some books in the bookshelf. Chris, The book would be worth it as he does the size of weather vane you are talking about in a swell body style.